Archer on Airguns: Lead free Pellets - Are They Any Good? Lead free Pellets - Are They Any Good? Great claims are made for lead-free pellets. Crosman claims their lead-free pellets have ultra-high velocity. Gamo says that their Raptor Power Pellets increase the power and velocity of your airgun up to 25%. But do they? In this post we’ll see what happened when I tested four pellets through the same air rifle. I didn’t select the gun or the pellets. All were shot “just as they were” to make a real world comparison. The results? Well sadly, the lead free pellets don’t perform well at all. Also note that the slowest pellets - The Peak wadcutters - actually had the greatest muzzle energy, while the Gamo Raptors (which again claim to increase the power of your airgun by up to 25%) actually generated 35% LESS muzzle energy than those slow old lead wadcutters. Hunters require muzzle energy for a clean kill, lead free pellets obviously don’t deliver. Gamo also claims their “Performance Ballistic Alloy” improves accuracy by 25%. Not true, I’d say, based on the results of this test. Accuracy of the lead free pellets was between 2 and 3 times worse than the lead pellets. 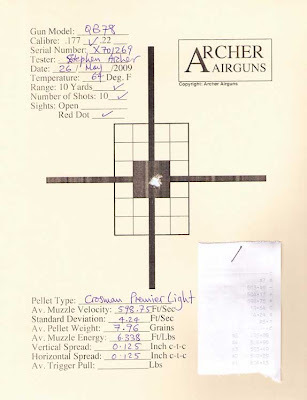 As you can see, the Crosman Premier Light lead pellets were very accurate in this gun - a great choice. 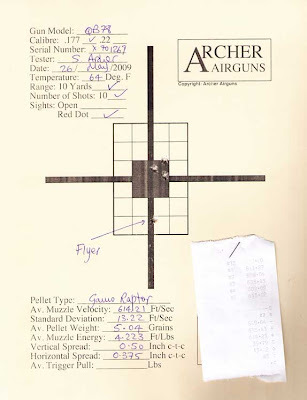 I use The Peak lead wadcutters for Archer Airguns “Gold Service” testing and have good luck with them: again we have an excellent group, but with one flyer half an inch from the main group. The Crosman lead free wadcutters made a ragged open group. 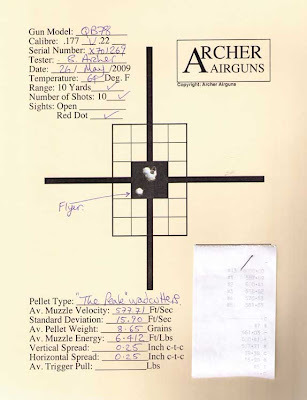 As for the Gamo pellets - well we can see only four holes, so two pellets must have gone in exactly the same place, but then we have a flyer a full 1 1/2-inches away from the group. The lead free pellets tend to shoot to the right of the lead pellets. For those who must have the highest muzzle velocity, the Crosman Silver Eagle wadcutters increase the performance of this QB78 by nearly 100 fps. But is it worth the compromise? Take a look at the test targets. What do you think? Wow great group from the CPLs, is that typical for the accuracy of these guns? Yes, the lead pellet groups are a typical representation for the accuracy of these guns. The gun I tested was selected entirely at random. I would love to see you test the Prometheus Dynamic lead free... Any chance??? Have you or will you test some sabot pellets. RWS offers them in both .177 and .22. I use them in my black powder .22 and .50 cal rifles and just love them. Any information you can offer on balistics and shot groups would be great. Hi Stephen, do you suppose the .22 caliber lead free pellets would fly any straighter than the .177 lead frees? How accurate is the QB36-1 and who makes it? Do You Need The Pellgun Oil Treatment? How Many Shots Can I Get From a QB79?